Dyson Hot And Cool Fan Heaters - Are They Worth It? - Which? The Dyson Hot and Cool fan heaters cost a pretty penny, but are they a worthwhile investment? We’ve tested the Dyson Hot and Cool AM05 and AM09 fan heaters to find out. We’ve tested both the Dyson AM05 and AM09 fan heaters to see if their eye-watering price tags are justified, or whether a cheaper model will do a better job of warming your cockles. Read on to discover what you get with a Dyson fan heater, and what your alternatives are. 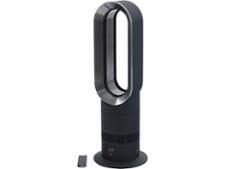 The Dyson AM05 and AM09 fan heaters share some similarities. For instance, they both have an oscillating function - meaning you can set them to rotate to help warm up the whole of the room, instead of blowing air in just one direction. The thermostat can be set from 0-37°C on each model in 1°C steps. They also come with a remote control, which you can magnetically attach to the body of the heater, for controlling all the heater functions. 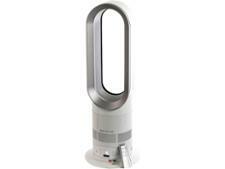 The Dyson Hot and Cool AM09, unlike the AM05, lets you choose narrow- as well as wide-angle blowing. So you can choose whether you want a more powerful jet of air in a focused direction – while you watch the TV, for instance – or a wider distribution of warm air to heat up an entire room. The Dyson AM09 also has a timer that you can use to programme the heater to turn itself off. You can do this in 15-minute steps up until one hour, and then in one-hour steps – up to a maximum of nine hours. Scroll down to see the table below and find out if great heating is the result of all of this functionality – or whether you’re better off with a cheaper, alternative model. 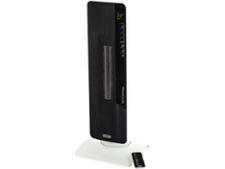 If you just want to see which electric heaters excel in our tests, head to our Best Buy electric heaters. The Dyson Hot and Cool AM05 looks unlike any other portable heater we've seen - but the £350 price tag could be hard to justify when others cost just a fraction of the price. We tested the Hot and Cool oscillating fan heater to find out whether it's worth splashing out on. 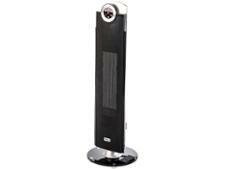 Read on to find out whether this portable electric heater wowed our experts in the test lab. We’ve put almost 40 electric heaters through our tough lab tests, and unearthed Best Buys that do a brilliant job of heating a room to get you comfortable quickly. Our experts have also found far less impressive heaters that’ll leave you waiting to warm up. Plus, those whose thermostats struggle to maintain the same temperature, whether working in a mild environment or battling much colder conditions. Which will mean you would have to constantly tweak the thermostat to keep yourself cosy. Throw any notion that price is linked to quality straight into the bin – our reviews show that you really don’t need to pay through the nose for great quality. 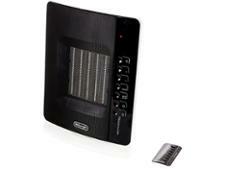 Check out our electric heater reviews for a great budget buy and to avoid overspending on a dud.